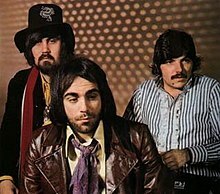 Aphrodite's Child was a Greek progressive rock band formed in 1967, by Vangelis Papathanassiou (keyboards, flutes), Demis Roussos (bass, acoustic and electric guitar, vocals), Loukas Sideras (drums and vocals), and Silver Koulouris (guitar). The band's career ended shortly after release of their most impactful album, 666, which has appeared on a number of lists of the top progressive or psychedelic albums of all time. Their first recording as a band was for George Romanos' album In Concert and in Studio where they played on four songs and were credited as "Vangelis and his Orchestra". In the same year, they recorded a two-song demo and submitted it to Philips Records. It was probably Vangelis's idea that the still-anonymous band should be relocated to London, which would be a more suitable environment for their music, as their country had entered a right-wing dictatorship in 1967. This decision, however, was not problem-free. Koulouris had to stay in Greece to fulfill his military service, while the band, on their way to London, got stuck in Paris partly because they did not have the correct work permits and partly because of the strikes associated with the May 1968 events. Essentially, the ambitious double album was Vangelis's concept, created with an outside lyricist, Costas Ferris. The music Vangelis composed was much more psychedelic and progressive rock oriented than anything the band had done before. This did not sit well with the other band members, who wished to continue in the pop direction that had brought them success. Furthermore, Roussos was being groomed for a solo career, having recorded and released his first solo single "We Shall Dance" (with Sideras on drums) and his first solo album On the Greek Side of My Mind. Meanwhile, Vangelis turned his attention to recording the score for the 1970 French TV documentary L'Apocalypse des animaux, and worked on a single with his then-girlfriend Vilma Ladopoulou, performing with Koulouris under the pseudonym "Alpha Beta". By the time 666 was finally released almost two years later in June 1972, the band had already split up, despite having sold over 20 million albums and remaining very popular throughout Europe. Both Vangelis and Roussos pursued successful solo careers: Roussos had a thriving solo career as a pop singer, and Vangelis went on to become a highly regarded electronic music artist. Vangelis's work composing movie soundtracks brought him much success for the next three decades, including an Oscar for Chariots of Fire. Vangelis's other soundtracks include Ridley Scott's Blade Runner (1982), to which Roussos contributed vocals, 1492: Conquest of Paradise (1992) and Oliver Stone's Alexander (2004). Roussos died in 2015. Koulouris worked with both Roussos and Vangelis on occasion, while Sideras pursued a less successful solo career, releasing an album and the single "Rising Sun" after the break-up. As of 2017, Sideras still lived in Greece and performed with his band. Despite their short existence and lack of hit singles outside of Europe, the band is respected as a cult band, and their album 666 is often considered their masterwork in addition to being one of rock music's first concept albums. The album caught the attention of many in the progressive rock field, including Yes frontman Jon Anderson, who would later collaborate with Vangelis (as Jon and Vangelis). Contemporary progressive rock acts such as Astra have also cited the band as an influence. In 2004, Gregorian released a cover of "The Four Horsemen" on their album The Dark Side. In 2005, German dance group Scooter released a Techno version of "The Four Horsemen" called The Leading Horse on their album Who's Got The Last Laugh Now?. In 2015, the Greek band Cyanna Mercury (formerly known as Cyanna) covered "The Four Horsemen" on the Death Roots Syndicate compilation The End. "The Four Horsemen" has proven an especially popular cover among European heavy metal bands. Bands that have covered the song include the Italian band Death SS (on their 2006 album The 7th Seal), the Swedish doom metal band Griftegård (on an EP released through Ván Records in 2015), and the Greek black metal band Rotting Christ (on their 2016 album Rituals). In 1990, several tracks from the 666 album were sampled for the first Enigma album, MCMXC a.D..
^ a b c d e f Strong, Martin C. (2000). The Great Rock Discography (5th ed.). Edinburgh: Mojo Books. p. 1027. ISBN 1-84195-017-3. ^ Murrells, Joseph (1978). The Book of Golden Discs (2nd ed.). London: Barrie and Jenkins Ltd. pp. 234–235. ISBN 0-214-20512-6. ^ "Elsewhere: Interviews, La Repubblica, March 28, 1989". Elsew.com. Retrieved 2015-08-19. ^ Murrels, Joseph (1978). British Hit Singles & Albums (2nd ed.). London: The Book of Golden Discs. p. 234/235. ISBN 0-214-20512-6. This page was last edited on 23 February 2019, at 05:53 (UTC).